Fundamental to scriptural Church Polity is the notion that Christ rules in the Church, and does so by means of office-bearers. Today’s office-bearers have only local jurisdiction. Christ was pleased to give authority to particular persons. In Matthew 16 we read of Christ giving authority to the apostles. There we read of Christ asking His disciples, “Who do men say that I, the Son of Man, am?” (vs 13). Peter replied, “You are the Christ, the Son of the living God” (vs 16). Jesus then said, “Blessed are you, Simon Bar-Jonah, for flesh and blood has not revealed this to you, but My Father who is in heaven. And I also say to you that you are Peter, and on this rock I will build My church .…” In Greek the name ‘Peter’ means ‘rock’. Jesus, then, says He’ll build His church on Peter. Yet the Lord’s intent is not to build His Church on the man Peter, but rather to build His Church on Peter’s confession. That is: Christ will build His Church on the confession that Christ is the Son of the living God. Jesus then went on to say, “And I will give you the keys of the kingdom of heaven, and whatever you bind on earth will be bound in heaven, and whatever you loose on earth will be loosed in heaven” (vss 17-19). As Christ builds His church on the confession of Peter, he gives to Peter the keys of the kingdom of heaven. Yet the keys were not given simply to the individual Peter, but in him also to the other disciples in their capacity as office-bearers. That becomes evident from Jesus’ further words in Mt 18, where discipline (one of the keys by which one binds and looses) is a power given to the church. Again, after His resurrection, Christ “breathed on” the disciples, “and said to them, ‘Receive the Holy Spirit. If you forgive the sins of any, they are forgiven them; if you retain the sins of any, they are retained’” ((John 20:22,23). The twelve (now minus Judas Iscariot) were entrusted with the function of overseeing the entrance to heaven. In a word, the disciples and the apostles received Christ’s authority. So it was that the apostles, after the Holy Spirit had been poured out, set themselves to preaching the gospel. By so doing they, in accordance with the authority they had received, opened the kingdom of heaven. Equally, they spoke candid words of admonition when necessary. For example, in Galatians 2:11-14 we read how Paul rebuked Peter to his face for his hypocrisy. Likewise in 1 Corinthians 5 we read how Paul exhorts the Church at Corinth to exercise church discipline against a brother guilty of sexual immorality. In the face of such sin there was no room for this man in heaven. Both through preaching and the exercising of church discipline we find the apostles busy with opening and closing the kingdom of heaven. But the apostles could not live forever. Who would receive their authority when they received the crown of glory? Other apostles could not be appointed in their place, since to be an apostle you had to be a witness of Jesus’ work and resurrection from the dead. That is clear from Peter’s words in Acts 1, when a replacement apostle was sought for Judas. Peter said to the crowd, “Therefore, of these men who have accompanied us all the time that the Lord Jesus went in and out among us, beginning from the baptism of John to that day when He was taken up from us, one of these must become a witness with us of His resurrection.” When the apostles died there were no more witnesses of Christ’s resurrection, and so no replacements for the office of apostle. So the office of apostle ceased. Yet that does not mean that their authority ceased to exist on this earth. For the Lord of the church moved His apostles to designate men who received the authority to open and close the kingdom of heaven. After the apostle Paul and Barnabas had proclaimed the gospel in Asia Minor, they visited the infant churches and “appointed elders in every church” (Acts 14:23). In Titus 1:5 Paul tells Titus that he left him in Crete “that you should set in order the things that are lacking, and appoint elders in every city as I commanded you.” 1 Timothy 5:17 makes a distinction between elders who rule and elders who labour in Word and doctrine, with some overlap between the two. We have come to know these distinctions as elders and ministers. Here, then, is drawn out what the apostle wrote about the ascension of Christ. At His ascension Christ gave gifts to men; “… He himself gave some to be apostles, some prophets, some evangelists, and some pastors and teachers” (Eph 4:11). Of the 4 offices mentioned in this text, the office of pastors and teachers (i.e. elders) is the only one that is still present today. The office of apostle ceased with the death of the last apostle. The office of prophet (Acts 11:28 and 21:10 speak of a prophet named Agabus) also ceased when the Bible was completed, for no new or further revelations were required (cf Rev 22:18ff). Timothy and Philip were both evangelists (cf Acts 21:8 and 2 Timothy 4:5), but it is difficult to ascertain what exactly this office entailed. Certainly there is no instruction in the Scripture that there is to be in Christ’s church an office of ‘evangelist’. So we are left with the “pastors and teachers.” It is through them that the Lord is pleased to rule His Church today. These “pastors and teachers” are variously referred to in Scripture as presbyters or elders, bishops or overseers, as well as shepherds and guardians. To these office-bearers the Lord has given authority, and so the apostle asked honour for these brothers. “And we urge you, brethren, to recognise those who labour among you, and are over you in the Lord and admonish you, and to esteem them very highly in love for their work’s sake” (1 Thessalonians 5:12,13). A similar exhortation is given in Hebrews 13:17, “Obey those who rule over you, and be submissive, for they watch out for your souls, as those who must give account. Let them do so with joy and not with grief, for that would be unprofitable for you.” Because the Head of the church has given His authority to the elders, it is for all God’s people to show these elders honour and respect – not because of their person, but because God has given His authority to them. If it is true that office-bearers receive their authority from God, then it follows that they have no authority of their own. When they teach, then, or admonish, they must speak and act according to God’s Word. As soon as an office-bearer does otherwise, he steps outside His God given authority and endangers the Church of Christ. In the words of the elders, then, the congregation must be able to hear the Voice of the Shepherd. Similarly, since office-bearers derive their authority from Christ and His Word alone, they are never allowed to come with a sword in an effort to enforce obedience to God. They cannot, for example, mobilise the authorities to support them by means of imposing fines or a prison sentence. An office-bearer’s authority is spiritual. Though this may appear to be stating the obvious, past incidents in the history of the church serve to remind us that this has often been forgotten. How far, now, does the authority of an office-bearer extend? The authority of the apostles was universal. Hence the apostle Paul could with authority write letters to the church in Rome, the church in Corinth, the churches in Galatia, the church in Philippi, Colosse, Thessalonica, etc. Similarly, when the apostle John was on the island of Patmos he was told by the Head of the Church to send a letter to each of the seven churches in Asia Minor. Have elders a similar authority? May elders of the church of one city exercise any degree of authority in, say, the church of another city? The universal character of the authority given to the apostles died with the office. In Acts 14:23 one reads that elders were appointed in every church. None of the elders were appointed to serve all the churches. Likewise in Titus 1:5 we read that Titus had been left in Crete to “appoint elders in every city.” Again, in Revelation 2 & 3 we are introduced to seven local office-bearers; each “angel” (presumably minister who is also a ruling elder) was attached to a local congregation. It is also instructive that the church in each locality is described in the New Testament as a1 “body of Christ” (1 Cor 12:27). That is: each local church is complete in itself, completely a church. Further, it is important to note that the Voice of the Shepherd is heard locally. The preaching of the gospel (a responsibility of the elders) occurs by the speaking of men, and by the nature of the case that is inherently local. By the preaching of the gospel, through Word and sacrament, the church is locally gathered. So no single church is above another church (more on this point next time), and no officebearer is above another officebearer. In the words of Jesus Himself, “One is your Teacher [or Leader], the Christ, and you are all brethren” (Mt 23:8). This reality has received concrete expression in Article 802 of our Church Order, where we read, “No church shall in any way lord it over other churches, no office-bearer over other office-bearers.” No officebearer within the bond of churches can dictate what must be done in another church. His authority is local only. Note: the Greek does not have the definite article “the”. It is therefore wrong to translate here “the body of Christ”. Rather, the church of Corinth is “a body of Christ”, complete in itself. The equivalent of Article 74 of the Church Order of the Canadian Reformed Churches as printed in the Book of Praise. Guido deBres originally placed this sentence in Article 30 of his Belgic Confession. After deBres died a Church Order was written, and so it was deleted from Article 30 and made Article 1 of the Church Order. It now has a place at the end of the Church Order not because the article is not so important, but simple because this is where it fits best in relation to the overall structure of the Church Order. 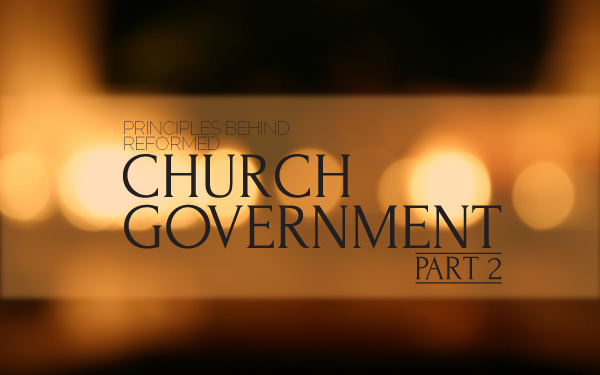 This article is the 2nd of a 4 part series on the principles behind reformed church government.